It’s no secret that Hollywood is always looking for the next big thing. It’s readily apparent that part of this search for future success involves an examination of the past. I’m convinced that producers discuss the odds that today’s all-important youth market are familiar with an old idea and the probability that they can get away with “borrowing” that old idea. This is why we can often watch a modern film and say, “When I saw this movie, it was called (fill in the blank with old movie here).” Despite the fact that the Transformers franchise was well-established and successful, someone at Paramount apparently thought, “Hey, kids today don’t know E.T., let’s turn that into a Transformers movie!”. And thus, we have Bumblebee. It’s 1987 and Charlie (Hailee Steinfeld) is a teenager girl who is emotionally adrift. Still reeling from her father’s death, she can’t cope with the fact that her mother (Pamela Adlon) has a new boyfriend. She hates her job (at Hot Dog on a Stick) and has no close friends. She spends her days listening to alternative rock and attempting to repair her father’s old Stingray. Her luck begins to change when she finds a beat-up Volkswagen Beetle in a junkyard and is allowed to take it. Charlie soon learns that this is no ordinary car. It is a Transformer, an Autobot to be more precise, who is on the run from the war on Cybertron. Sent to scout Earth as an Autobot safe-haven, B-127 had its memory circuits damaged. Dubbing the car/robot “Bumblebee”, Charlie promises to keep it safe. Little does she know that the military, in the guise of Agent Burns (John Cena) is working with two Decepticons in an attempt to find and obliterate Bumblebee. The statement above linking Bumblebee with E.T. may have sounded like hyperbole, but make no mistake, it was completely serious. The bulk of Bumblebee is almost a blow-by-blow remake of Spielberg’s 1982 classic. A teenager whose father is not in the picture and who has a bratty younger sibling is visited by a stranger from outer space who is confused and lost. The teen takes in the alien and attempts to hide it from their mother. The alien gets loose in the house and makes a mess. A government agent is tracking the alien and doesn’t care that it’s sentient and has feelings. There’s a tearful goodbye at the end. No, a battle-ready robot is not the same as a gangly alien, but the similarities cannot be ignored and I would not have been surprised if there had been a shot of Bumblebee flying in front of the moon. The overall effect of Bumblebee is something which is begrudgingly good. It blatantly steals from a better movie, but it also avoids the mistakes of the previous entries in the series. So, in the end, it’s almost a draw. The film is very predictable and it’s never met a cliché that it didn’t embrace, but it also moves at a nice pace, and rarely slows down long enough for the viewer to dwell on how derivative it is. As usual, the CG effects are astonishing and completely seamless and Steinfield (who has proven in the Pitch Perfect films that she can be incredibly annoying) tones it down to deliver a believable performance. The 80s setting is a nice touch and the musical choices are spot on. (80s music fans should be sure to freeze-frame on Charlie’s cassette collection.) If nothing else, Bumblebee feels like an apology for the last few Transformers films and offers some hope for subsequent movies to finally do Optimus Prime justice. Bumblebee should take a Memo on shoe-horning unnecessary sidekicks into movies on 4K UHD courtesy of Paramount Home Entertainment. The film has been letterboxed at 1.78:1 and the Disc contains a 2160p transfer which runs at an average of 60 Mbps. The image is very, very sharp and clear, showing no noticeable grain and no defects from the source materials. The crispness of the picture is very impressive and this helps to deliver a great amount of detail. The colors look great and the image is never overly dark or bright. The depth works very well, providing a quasi-3D look. The Disc carries a Dolby Atmos audio track which runs at 48 kHz and an average of 6.0 Mbps. The track provides clear dialogue and sound effects. The action sequences sound fantastic, as the subwoofer hammers home each explosion and laserblast. The surround sound effects are nicely detailed and we can easily pick out specific sounds. The audio moves very smoothly from the front to the rear and back. 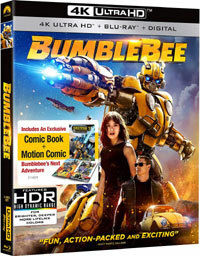 The extra features for Bumblebee are found on the Blu-ray Disc included in this set. “Sector 7 Archive” contains two sections. “Agent Burns: Welcome to Sector 7” (1 minute) is a recruiting video featuring Cena’s character. “Sector 7 Adventures: The Battle at Half Dome” (9 minutes) is an animated Transformers piece which looks like a comic book. We get nine DELETED AND EXTENDED SCENES which run about 19 minutes. Most of these are brief, but they do show an opening which doesn’t feature Cybertron and two friends of Charlie who didn’t make the final cut. This is followed by a 10-minute reel of OUTTAKES…which is just weird. “Bee Vision: The Transformers Robots of Cybertron” (4 minutes) goes back to the opening scene and identifies each of the characters. “Bringing Bumblebee to the Big Screen” is a making-of featurette which contains five sections; “The Story of Bumblebee”, “The Stars Align”, “Bumblebee Goes Back to G1”, “Back to the Beetle”, and “California Cruisin’ Down Memory Lane”. These segments offer interviews with the cast and creative team, on-set footage, and a nice look at how the character designs here compare to the original animated series.